Sometimes I think my blogging background gives me a somewhat different perspective on some of the things that occur in Eve Online. Not the fact that I blog, just the topics. I've observed the War on Bots for almost two years and covered CCP's efforts to suppress the practice fairly heavily for about one year. So sometimes I see danger where others think "So what?" The recent unpleasantness surrounding the legalized macroing is a case in point. I'm dumbstruck that people don't see how bad allowing someone to perform hundreds of actions in game with one mouse click is for Eve. Others think I am totally out of my mind for seeing any problem. One of those players, Ruby Porto, followed me in the comments from The Mittani DOT Com to the blog. After reading the comment he left, I thought I'd devote a post to answer them because I think he raises some points I have not adequately explained. Let's break this down into bite size pieces, interview style. "In Microsoft Word and other programs, a macro is a saved sequence of commands or keyboard strokes that can be stored and then recalled with a single command or keyboard stroke." For those who may not know I wrote an article for The Mittani DOT Com that was published yesterday. I discussed some of the aspects of the current controversy of the creation and use of macros by the market/industrial community. I'd like to take a little closer look at one of the issues: what is an acceptable macro? "Macros are legal in Eve?" you ask? Blasphemy! Exactly my point. The vast majority of players never read the EULA or, if they do, just gradually glance over the document. In many ways the situation is very similar to that of Christianity in medieval times when the vast majority of the laity could not read and depended on the priesthood to read the holy scripture to them. And since they were the only ones who could read the words, they also interpreted the words to their flocks as well. In today's world almost everyone using a computer can read and since every game company includes a catch-all "we can kick you out of the game any time we want" clause anyway, why bother reading if you follow the standard socially acceptable behavior within a game? So most people don't. Those following the whole controversy know that the butterfly effect led the attention to move from Kelduum's desire for some ISK seized by CCP that was donated by someone banned two weeks for botting who proceeded to rage quit to some of the code practices of the developers of market tools. Apparently CCP allows those playing the market to use some relatively simple but powerful macros as part of their gathering of market information. The video above is something I wanted to show in my article that appeared on TMC but was unable to due to not knowing how to work the site yet. This promotional video is from Eve Mentat, a tool that comes up frequently in discussions on the subject. The video shows the Eve Mentat web page looping through 67 items, opening the market window for each one. By definition, clicking on one button that performs 67 tasks is a macro. The question then becomes, "is the macro legal?" However the developers of the market tools and their market and industrial users claim otherwise. But the question is, if market tools like Eve Mentat utilize macros should CCP allow that? Before you answer, scroll the Eve Mentat video to 2:55. The video shows that Eve Mentat also detects when a buy order is undercut and automatically calculates a price .01 ISK lower than the lowest order that the user can then paste into the market order. Very useful for playing those .01 ISK games on the market, right? I've heard a lot of people complain about bots undercutting them by .01 ISK every five minutes because they can't imagine someone constantly looking through the market windows watching when someone undercuts them. But with a tool like Eve Mentat a player doesn't have to open hundreds of market windows. All the player has to do is put up a bunch of orders, have the macro populate the cache and then Eve Mentat highlights the orders that need attention. After that, rinse and repeat. A player would only need to do this every 5 minutes if he has 100 active orders, which is how often a player can update an order. So all of you complaining about the market bot constantly undercutting you by .01 ISK every 5 minutes? Probably not a bot. You just ran into someone using "legal" macros. Following the logic of the market/industrial community, you should HTFU and go out and get your own macro. Apparently that's what Goonswarm did with their Goonmetrics market tool. But to tell the truth, I always thought Eve Online was a player vs player game, not a player vs macro or macro vs macro game. The rankings of the top twelve MMORPGs as determined by the players of the Xfire community from play on Sunday, 10 February 2013. For more details about the methodology, click here. Historical data can be found here. The Xfire community once again saw its interest in playing MMORPGs dwindle, with the number of hours spent playing the 12 most popular games declining by 7.5%. Ten of the twelve games saw a drop in playtime, led in percentage terms by The War Z (-17.8%), Metin 2 (-16.6%) and APB: Reloaded (-16.5%). 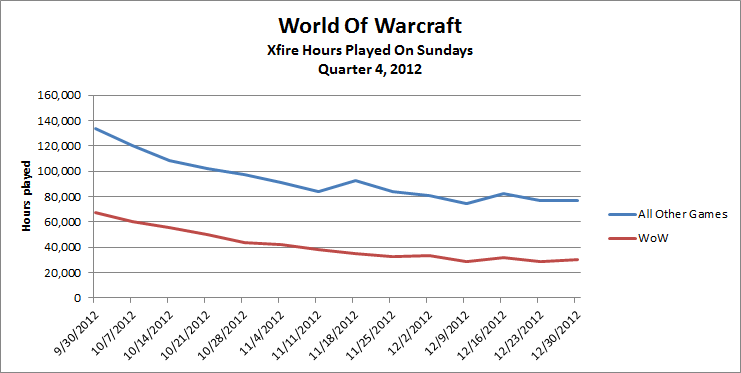 The two games that saw an increase in playtime were Eve Online (+4.1%) and Tera (+0.4%). Change is Bad? I didn't like the changes to the Xfire site 3 weeks ago and I possibly was not alone. Over the past 3 weeks the number of hours played has declined 12%. Four of a Kind: For the first time in the history of the Digital Dozen four games, World of Warcraft, Guild Wars 2, Tera and Star Wars: The Old Republic, have double-digit scores. Does this represent weakness in the perennial heavyweight WoW or are we seeing new games launched over the past 15 months making their mark on the genre? More Servers: The increasing rank of Tera on the list isn't a fluke event just occurring within the Xfire community. On 12 February En Masse added 2 PvE and 1 PvP server as well as limit character creation on the four most popular servers. I don't know what it is about this time of year but my attention wanders from actually logging into Eve a little. Back in 2011 I jumped into the Rift beta and played for a month or two before determining I was sick of elves. Last year I spent January playing way too much Star Wars: The Old Republic and didn't really get the thrill back for playing Eve until I got to Fanfest. This year I've pretty much only logged in to set my skill queues for the last two weeks. Am I disgruntled with the Eve? A little bit. The whole "macros are legal after all for a class of players" thing pisses me off. I normally don't get upset with people making lots of money. If someone can figure out how to do it within the rules, more power to them. I just question whether clicking on one button that allows me to perform hundreds of tasks in game really follows the spirit of Eve. If I wanted that type of game play I would have stayed in World of Warcraft where players using mods to enhance their abilities is an accepted practice. Let's just say right now anyone who uses these macros and then complains about market bots gets no sympathy from me. So while I cool off I'm playing Guild Wars 2 and The Secret World. I think my time in GW2 is drawing to a close as I reached level 78 last night. I finally got my leatherworking over 225 so I no longer have to farm mobs for cotton. I also have my jewelry skill over 250 so I have a new set of recipes to learn and my only hold up is mining gems. I need to get to 400 in each to max out those professions. And I am progressing nicely in my personal story but haven't reached the level 70-80 quests in that chain yet. I only have 26% of the map explored and haven't tried PvP yet but the game doesn't interest me enough to start up a new alt or try to grind up for a legendary weapon. At least not right now. The Secret's World continues to amaze every time I put on my headphones. The sounds are just amazing. I paid $30 for the game and I think I'm getting my money's worth. I've played close to 100 hours now and I'm just finishing up The Savage Coast. I did do the "Strangers from a Strange Land" mission that led me into the Blue Mountain zone where I ran into two ravens, Muninn and Huginn. Before CCP created tech 2 cruisers Norse mythology had two ravens that sat on Odin's shoulders. I'm working on the Slayer deck but right now I'm beginning to doubt whether I want to play that. I think the decks are like Eve's certificates. They are a guide to what works for those who don't want to theory craft. Unlike Eve, however, each deck comes with a set of clothes once you learn all the skills. I might start learning some more weapons than sword and assault rifle. Right now I can wield the Q7 level of both weapons. Just because I'm playing other games doesn't mean I'm not covering the shenanigans in Eve. I finished listening to Ripard Teg's interview with Xander on Crossing Zebras and only have three more interviews to listen to. And of course I will have a bit more to say about the whole market macro situation. But for now I'm going to run about on virtual dirtballs for a little while longer. I poked fun at the subject yesterday but the election season for the Council of Stellar Management CSM) is upon us. For those unfamiliar with the institution the CSM was created to provide feedback from the community to CCP so that the developers don't screw up. This also came in the wake of the T20 scandal so the CSM also gave CCP a chance to display a measure of transparency to the player base. The execution of the idea has not always worked as intended. The current body, commonly referred to as CSM 7, had a much more quite time than their predecessor but may have solidified greater power for the next group of players we will elect in April. So if the CSM is actually serious business why do I call this the silly season? Because politicians, whether they deal with internet spaceships or are the more mundane type who reside on a ball of mud we call Earth, tend to do and say silly things. With the beginning of the candidacy application period still three weeks away the spaceship politicians are moving into full campaign mode. For those looking to start blogging about Eve, now is the perfect time to begin. As the institution of the CSM has matured so has the debate surrounding the election. One could make a strong case that the debate amongst the candidates will prove more substantive than the U.S. presidential election campaign we endured last year. For those not well-versed in the issues surrounding the game now is a good time to learn and putting those thoughts on the interwebs. Another reason for beginning a blog now is that the Eve blogosphere and some of the associated websites are about to see the output of some rather prominent writers drop due to the workload that membership requires. 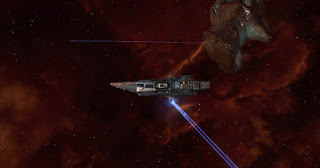 The most prominent member of the Eve blogosphere, Ripard Teg is running with a good shot to win. His output might fall down to a shocking 5 posts a week and his topics will definitely change with a change in status within New Eden. Other members who work at the big news websites like Mynnna at The Mittani DOT Com and Mino Noud at Eve News 24 are also running. Mynnna, as the officially backed candidate of Goonswarm is almost guaranteed of a CSM spot. So spots in the Eve universe for writers are opening soon. So sit back, relax, and start surfing the net because even if you don't start blogging an interesting time for Eve is about to begin. I just think writing about the whole circus is more fun than reading about it. I'm starting to do my due diligence as many of the contenders for seats on the eighth incarnation of Eve Online's Council of Stellar Management begin the political battle ahead of the official start of the race. Those interested in the early jockeying for power should visit the CSM 8 page for the Crossing Zebras podcast where Xander is doing a great job conducting 30 minute interviews with each of the hopefuls willing to submit themselves to his hard-hitting interviews. So far I have only made it through the first ten but so far I've found the interviews very helpful. As we go through the process a concern has arisen that some of the people running should not run as they would help the Eve community more from a position outside the power structure than within the halls of CCP. I think the biggest example is Ripard Teg. Jester's Trek is one of the biggest and most influential blogs in the Eve blogosphere and Ripard is a frequent critic of the current CSM. I think some players want a critical voice on the outside to help keep the CSM from doing anything too foolish. So do we really need to fear living in a post-Jest-ocolyptic world where Ripard ascends to Reykjavík to sit at the right hand of God? I don't believe that the NDA will completely shut down Ripard's blogging but if he really does have to spend 20 hours a week performing his duties I don't see how his output can't decrease unless he truly is the robot many in the blogosphere believe. And when he does blog I don't see how he is not going to temper his criticisms, especially when he has to pull punches to ensure he does not break the NDA. But if Alekseyev Karrde could continue doing the Declarations of War podcast then Ripard can keep blogging. Some people act like Ripard's is the only one shining a spotlight on the CSM. If Ripard wins then the loudest voice I know of in the blogosphere doing the same is Poetic Stanziel. He is definitely not afraid to put up controversial positions on his blog Poetic Discourse although his quality of output is inconsistent. At times brilliant he sometimes winds up deleting and rewriting posts that he publishes in the heat of the moment. In a post-Jest-ocolyptic world Poetic would become an even greater voice in Eve's blogosphere. Of course, for those fearful of that prospect I will conclude with the old Eve adage, HTFU. Anyone who doesn't like the situation enough to cry about it loudly on the Internet should think about joining the Eve blogosphere instead. I know from personal experience that blogging software like Blogger is free. All it costs is a little time. Who knows, maybe you'll emerge as the next Ripard Teg. With the launch of Retribution 1.1 yesterday some became concerned over the introduction of a dueling mechanic designed to allow players to fight a 1v1 battle in high sec. I always decline duel invites in all other games I play and I expect to check the auto-reject invitation box as soon as I find it. For me, the deciding factor in whether Eve should have a dueling system is if the lore not only allows the practice of dueling but also makes logical sense. Last week was apparently a busy week in real life for the Xfire community as the number of hours spent playing the top twelve most popular MMORPGs declined by 9.2%. The leaders of the downturn in percentage terms were Tera (-23.6%), Planetside 2 (-17.2%) and APB: Reloaded (-14.7%). The two games most successful in bucking the trend were The War Z (+12.7%) and Aion (+9.2%). A Technical Glitch? I'm not sure if everything was working correctly with Xfire on Sunday. I think I saw some strange behavior on the Xfire site so I am not really looking at the raw numbers this week. One Week? Did Tera's move to the free-to-play model only move the Korean import past Star Wars: The Old Republic for one week? That depends on how well SWTOR's Game Update 1.7 is received. In addition to adding "The Relics of the Gree" event to Illum the Bioware devs added a new "Reputation" system that affects all of a players characters on a server. Next week should be interesting. First Person SOE - I've wondered about the ability of Planetside 2 to remain on the list given all of the complaining about hacks and aimbots I keep reading about on the forums. But the game has consistently remained ranked in the 7-9 position throughout 2013 so far. With the current lack of MMOFPS games on the market for the PC the SOE product could find a steady niche in the market. I have not spent much time in Eve Online lately because I am working on an article explaining why purchasing in-game currency on the secondary market (i.e. from ISK sellers) is a bad thing. I am finishing up my research and have the introduction already written. But I'm collecting a lot more information than I can possibly use or justify including in the article. A shame really since some of the quotes quite interesting. I thought I'd share some of the research that might otherwise remain squirreled away. Some people may remember when the quotes appeared. Enjoy! Note: To all of you coming to this post expecting nice juicy pieces of anti-Eve University gossip, you'll have to leave disappointed. I am leaving the body of what I wrote this morning up so 1) everyone will know what was originally referred to and 2) as a reminder why I usually never write a post like this without thinking about and researching it for at least a day. I'm not good at it. Skip down to the update (beginning at the embedded tweet) to find something that is accurate. And an apology to Kelduum and Eve University. Over the past few days people have contacted me telling me how much they liked the article on Kelduum's post on the controversy surrounding botted ISK that Eve University received and then had seized by CCP. I just found out within the last hour that I failed to cover the story adequately. The situation is much worse than I suspected. "Currently, my knowledge of the game has grown such that I can start my bot with disabled graphics (thanks to some DirectX hooks), while running it in a fairly restrictive environment. The client’s memory footprint is 180 MB and consumes about 5% CPU while running. For all this boasting, I should note that this client is greatly modified and must be edited after each official patch CCP releases in order to work." That's right, the Evelopedia is linking to an application that uses bots to run. Because the Evelopedia is on the official site everyone will think that CCP approves of using this application. Now, the Evelopedia allows players to make edits and contributions. So who contributed this page? Eve University. I went over to the Eve University wiki and found the same wiki entry posted there. I'm pretty sure that curious innocent Eve University students will read the article and figure using the site is okay since no one at Eve University would post something that goes against the EULA. I'm imagining that the ever-helpful "John" had some part in creating the page although I haven't had a chance to ask around. I literally discovered this 30 minutes ago. I'm currently on the train about to disembark so I have not had the opportunity to look at the other entries to see if any other questionable sites that break the EULA are listed. I may have more to report next week. @evenews24 Can someone please tell me either I'm totally wrong or that this is just a bad dream? This post is why I should never attempt to write something serious in 30 minutes. Unless "John" is Neville Smit (yeah, right) the link to Jitonomic (I got Jitanomic from the wiki pages) was not posted by the mysterious botter. The link was also posted on 7 December 2010. All I needed to do was click on the history of the page in question on the Eve University web site and I would have seen who had updated the entry. And in Neville's defense I don't believe he knew about the botting connection when he posted the site as the blog entries at the link did not appear until December 2011. The one thing that is accurate is that Jitonomic does use bots to gather its market data. That information comes straight from the site. To Kelduum Revaan and Eve University I owe a big apology. They were the victim of a botter/hacker who didn't disclose his nature until long after the link was posted. I'm still a bit upset about people being directed to that site because people will think that someone at Eve University believes botting is acceptable. I'm example #1 and I apologize for not checking the story more carefully and for any additional harm this has caused in this whole affair. UPDATE 2: Neville Smit is still playing the game. He is not "John". UPDATE - Sunday 17 February 13: While I appreciate the discussion in the comments of this post I'm going to drop out and concentrate on more important things. But don't let anyone think that I do not consider the mistake I made in the post as unimportant. Based on recent events I made an assumption, added 2 + 2 and came up with 5. Since the facts were easily checked and I failed to do so I've apologized. Quite frankly, I did not live up to my own standards in this matter. But another big security issue is raging amongst the community now: how developers of market-related web sites and applications interact with game data. That is vastly more important than the procedures CCP and Eve University take in ensuring their wiki links are up-to-date. So I will move on to other things. But I will make sure to do my research the next time I write. I originally intended to close out my coveragethought about making today's post a summary of all of CCP Sreegs' comments in the locked thread on the Eve Online forums concerning the seizure of the botted ISK from Eve University. I decided not to because of all of the other issues that arose from the security chief's posting. I will probably include some of those points in my writings sometime closer to the start of the CSM 8 election campaign as I think the candidates need to address some of the issues. Instead I'll just give some final thoughts on the whole sordid episode. In February 2007 the T20 scandal rocked the Eve player base. The scandal surrounded the actions of one CCP developer who climbed to prominence within one of the most powerful alliances in Eve, Band of Brothers. In order to restore confidence CCP's CEO Hilmar Veigar Petursson apologized to the player base and named CCP Arkanon the head of the Internal Affairs department. Shortly thereafter CCP created the Council of Stellar Management, in part to provide more transparency for the way CCP operates. In the past CSM has expressed their displeasure about CCP's plans, ranging from the frustration of CSM 5's open letter to the emergency summit in the summer of 2011 following the launch of the Incarna to the quiet fuming that resolved itself in CSM 7's Winter Summit in December. But throughout the battles over business and game design decisions members of the CSM refrained from making charges implying that CCP was taking direct actions to help or hurt an alliance out of personal interest or malice. Until now. The Xfire community's interest in the top MMORPGs increased last week with the time spent playing the twelve most popular games increased by 4.2% last week. The games seeing the largest increase in time played percentage-wise were Tera (+97.6%) and APB: Reloaded (+11.4%). The games seeing the largest drops in time played were Metin 2 (-11.1%) and Star Trek Online (-8.0%). Xfire Updated - Last week Xfire finally stopped supporting their old format and templates and have forced everyone to use the new site layout. What does that mean for The Digital Dozen. Besides for making the process of recording the statistics more time consuming the biggest change is that I can no longer calculate the number of total number of hours the Xfire community spends playing MMORPGs. To give some idea of the trends I will now report on the number of hours spent playing the games on the list. SWTOR Falls To Fourth - As expected the launch of Tera as a free-to-play game propelled it past Star Wars: The Old Republic into third place on the list. The question that comes to mind is will Tera fall back to earth quickly or does the game have staying power? We may get a chance to see as SWTOR's first expansion, Rise of the Hutt Cartel, is not due out until sometime in Spring 2013. Can the Bioware product keep interest in the game up until then? WoW Is Dead ... Not! - While the folks at Gamebreaker TV had some fun with the Activision Blizzard Q4 earnings report that showed the World of Warcraft subscriptions had fallen to 9.6 million. But what does that look like when looking at the Xfire numbers? 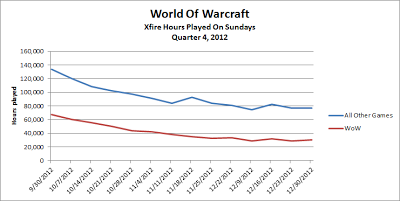 As we can see the number of hours played by the Xfire community for both World of Warcraft and all MMORPGs declined in the fourth quarter last year. However, WoW's decline of 55.2% was greater than the general overall decline of 42.3%. Obviously WoW's drop from 10 million down to 9.6 million wasn't that large but Xfire numbers usually only show trends, not actual numbers. Yesterday with the Sansha incursion in my low sec constellation still raging I decided to look into reports from a reliable source that the belts are going dry by the time the North American prime time hits. Since the reports came from Genesis I thought the problem might be the New Order driving miners from their interdiction systems forcing miners into over-mining other systems in Gallente high sec. But after reading the report I then checked with Chribba's web site Eve Offline and saw Tranquility had hit a peak concurrent user (PCU) number of 59,320. If this is not a record number for a non-Alliance Tournament day on TQ it is probably amongst the top 5 of all-time. So instead of scanning the asteroid belts looking for ore depletion I headed over to the system of Embod in Metropolis to check out another theory I had read: new players are stripping the belts in their Ventures. I have a confession. I ice mine in low sec. I don't go out to the ice belts too often, but I like to manufacture my own probes and some probes require strontium clathrates to manufacture. Combat probes require six units and deep space probes require eight. I could buy what I need off the market but what fun is that? High sec miners probably think I'm crazy. But I feel sorry for the denizens of the high sec ice belts. Not because of the activities of James 315 and The New Order. CCP allows emergent game play and if a bunch of players want to portray themselves as a bunch of religious zealots who sideline as extortionists, who am I to say that's wrong? No, I look at the poor ice miners who are mining not to fuel their POS but to make some easy ISK as exactly that: poor. Incursions happen. I had to deal with them when I was doing the Minmatar COSMOS missions in Metropolis' Ani constellation. Back then I just decided to go somewhere else as the shiny fleets of the Incursion runners farmed the content. When I logged in Tuesday night to do a little ice mining I saw that the forces of Sansha Kuvakei had found me again. The difference now compared to the situation in December 2011 is that I now live in low sec. Why does the the location matter? Because the shiny fleets do not enter low sec as their ships draw pirates like moths to a flame. So the war between the Minmatar and Amarr militias will move to other constellations and most pilots will retreat to areas not affected by Master Kuvakei's influence. But a few of us are sticking around trying to go about our daily lives. Today I have a tale of two purveyors of currencies used in our favorite virtual worlds. One, Avatarbank, is based in Pompano Beach, Florida, USA. The other, Koala Credits, calls Hong Kong home. So, besides a business that harms the games I love, what do these two companies share in common? Would you believe a database? The rankings of the top twelve MMORPGs as determined by the players of the Xfire community from play on Sunday, 3 February 2013. For more details about the methodology, click here. Historical data can be found here. The Xfire community saw a slight bounce back from last week's drop in interest of playing MMORPG's, with player's increasing their playtime by 1.2%. Games leading the rise were Tera (+73.9%), Guild Wars 2 (+14.1%) and Star Trek Online (+11.2%) while the games seeing the biggest loss of interest were Aion (-16.9%) and Planetside 2 (-15.0%). The Tera Wave - Today Tera launches its free-to-play version TERA: Rising. Tera's march to free-to-play reminds me of Aion's progress last year except that the NCSoft game started at a much higher place. I expect to see a lot of the free-to-play games on the list continue to fall next week as players leave their games to finally check Tera out. Guild Wars 2 is bucking the trend on the strength of their update last Monday that introduced the living story and a revamp to the dynamic leveling system. Can they continue? Left In The Dust? - While other free-to-play games are falling to Tera, what is causing the decline in Planetside 2's popularity? Is it the prevalence of aimbots? Is SOE having bug issues? If so, then perhaps CCP's MMOFPS DUST 514 is luring some gamers away from the PC to their consoles. Of course, DUST 514 is a PS3 exclusive so not all players have the option to switch. On the other hand, perhaps the DUST 514 open beta, which began 22 January, will not hold players and we will see the numbers trickle back up over the coming weeks. Starting 7 February 2012 I've presented the list every week, even managing to do so while in Iceland for CCP's Fanfest. I'd like to thank everyone who's given me encouragement during the past year and I hope to continue writing this column for a long time to come. I currently play three games, Eve Online, The Secret World and Guild Wars 2. Which of these games is not like the other? I would say Guild Wars 2. Eve Online is the famously niche sandbox skill-based PvP sci-fi game that, inexplicably to those who don't play the game, not only refuses to die but is still growing almost 10 years later. The learning curve is considered extreme and in order to continue growth CCP is attempting to lessen the curve while keeping the complexity. The game that seemingly never ends, Eve Online's real-time skill system takes years and years to learn all the skills offered. As for content, the real content are the players themselves and the way they use the sandbox. The game only ends when a player becomes tired and moves on. The Secret World is another niche game, but this time of the PvE variety. Set in a parallel modern world where all conspiracies are true, this horror-influenced MMORPG is also skill-based and while clearly a theme-park game I haven't figured out the order a player is supposed to go in once hitting a zone. Of course, after about 60 hours of play I'm still on Solomon Island so I'm getting the most out of my purchase price. Like Eve, once skill points are spent in The Secret World there are no resets. Also, the game is hard at times. Not Eve Online learning curve hard. Just hard getting through some of the obstacles. But getting through those obstacles gives a sense of accomplishment. For instance, figuring out the morse code mission the way I did made me feel really smart. And when I finally defeated The Boogy Man in the amusement park after the 15th attempt I cheered out loud. Sure, these events don't compare to the thrill and adrenaline rush of PvP combat in Eve, but I love them anyway. That leaves Guild Wars 2, which I consider a guilty pleasure. Why? The game is pretty much a theme park that I really haven't found that challenging once I switched to playing a ranger. I die a lot sometimes but I pretty much brush it aside. And leveling is easy. While I was writing the series about the Eve News 24 botting expose I would go into Guild Wars 2 and just kill things as a break. I decided I needed cotton scraps to level my leatherworking so I decided to walk from Lion's Gate to Blazeridge Steppes because I heard of a good farming spot. I started out as a level 62 ranger and five hours and three game sessions later I was level 67 and I don't think I ever ran into a mob that was higher than level 50 along the way. While the game lowered my effective level while traveling through the lower zones, I received a lot of level 60+ drops along the way. These are really clever game mechanics designed to allow higher level players to play with their lower level friends. They also made the trip worthwhile. So while I'm in low-sec in Eve Online probing down sites avoiding the faction warfare militias and facing complex puzzles in The Secret World, I can always go to Guild Wars 2 and relax by doing some farming. Farming I have to do by grinding mobs. But that kind of mindless game play does have a place as a change of pace.